HVAC system designer must give confidence to architects, building designer and owner that the ventilation system will perform as required. The client wanted to gauge the simulation of prevailing HVAC system to check velocity, humidity and hot pockets inside building HVAC application. It is very important to note that HVAC application is very important for successful operation inside building. According to the local weather conditions, it is critical that the building design and requirements, air flow and temperature are maintained at human comfort level. For that to be done it is important to be able to optimize the HVAC system for constantly changing requirements based on the capacity of building. It is also very important to make sure that the HVAC system designer gives confidence to architects, building designer and owner regarding the ventilation system to be performed as per the requirement. After understanding the requirement of the client, we decided to use ANSYS Fluent for the successful execution of the project. 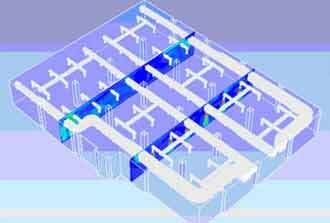 Hi-Tech CFD utilized ANSYS DesignModeler tool to create 3D CAD model of building and HVAC duct system. 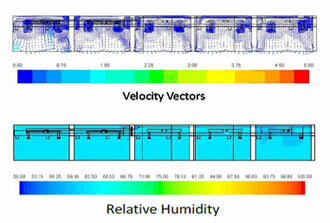 With the help of ANSYS Fluent the company was able to simulate and analyze human comfort inside the building. The company also determined the velocity, temperature, and relative humidity (RH) profile inside the building domain using CFD simulation. ANSYS Fluent was also useful in getting the flow simulation done after implementation of heat fluxes and supply / return air information. With the help of CFD simulation, the HVAC industry can perform testing and study design changes in virtual environment. It also ensured the client that installation of HVAC system would enable them to mention temperature and RH at human comfort level. CFD analysis helped in analyzing the design correction to make sure those requirements before the installation of HVAC system for value addition to the work. Utilizing CFD analysis client can classify the hot pockets inside the building, which might cause discomfort to the residents. Hi-Tech CFD is a leading Architectural, Engineering & Construction (AEC) and Industrial Engineering service provider in India. Hi-Tech provides solutions for Automotive, Aerospace, Process, Manufacturing, Energy & Utilities, Marine Industries. Hi-Tech believes in partnering with clients to provide robust and affordable engineering solutions to its client worldwide. CFD consultants at Hi-Tech CFD pass fluid dynamics problems through different types of processes that include problem Identification, calculation, flow simulation, flow visualization, comparing results and reports. For several years the company is providing CFD analysis and CFD simulation services that have made them the most trusted CFD outsourcing partner for offshore engineering companies. The company helps all types of engineering companies and industries to resolve fluid dynamics problems.